FCPO 3rd month Nov futures contract traded RM50 lower to close at RM2510 levels as compare to previous trading sessions with a total of 17,235 lots traded in the market. FCPO price opened almost unchanged as compare to previous settlement price and plunge lower during trading sessions as soybean oil and crude oil electronic trading were traded weak. FCPO price traded lower after attempt to penetrate previous high at RM2569 failed while FCPO price fails to hold above previous support levels at RM2540 regions. 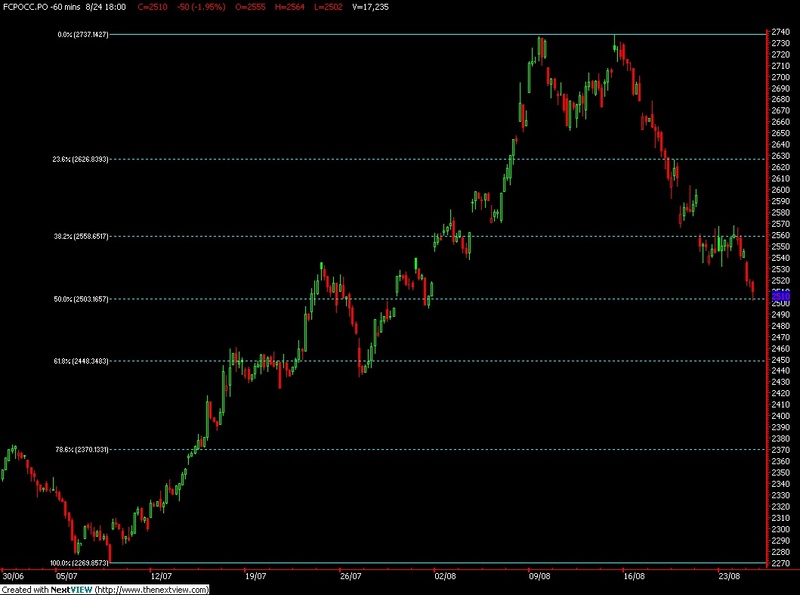 Technically, FCPO price seems temporary supported on RM2503 support levels; 50% Fibonacci support levels, in the hourly price chart. 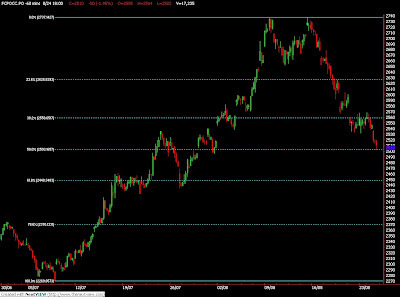 Failure to hold FCPO traded price above support levels at RM2502 and RM2448 shall indicates further selling pressure. 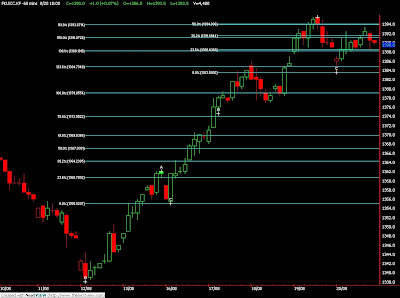 Resistance levels seen at RM2550 and RM2570 regions. FKLI Aug Futures contract traded 2.0 points lower to close at 1399.0 levels as compare to previous trading session to with a total of 5,108 lots traded in the market. Wild trading day for FKLI price trading as FKLI open lower for trading and soon reach new height before plunge lower towards day low as regional indices sudden turn towards south during 2nd trading sessions. FKLI price seems supported above previous support levels at 1396 region before manage to surge higher towards 1403; at 38.2% Fibonacci resistance levels; in the hourly price. 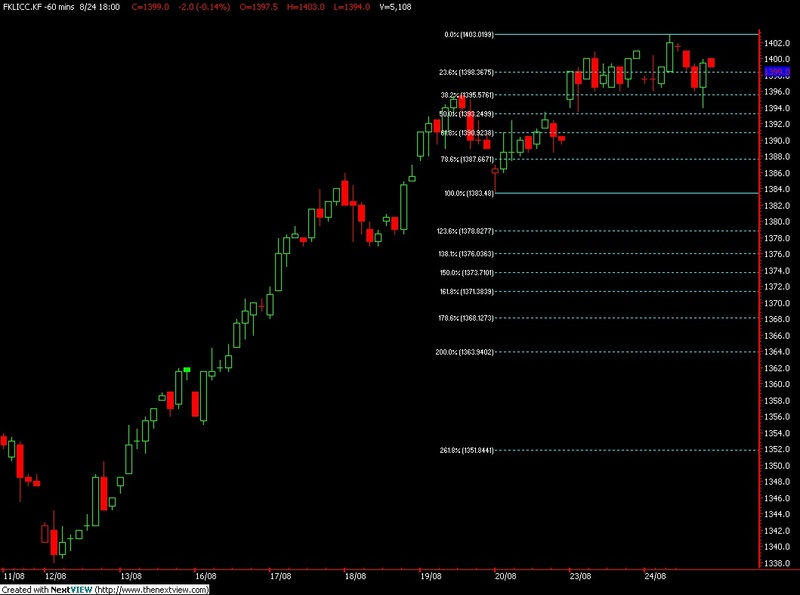 However, FKLI price seems falling towards day low to reach 1394 before settle at 1399; 61.8% Fibonacci rebound resistance levels. Technically, FKLI price seems likely to undergo some correction phase where next nearest support levels seen at 1390 and 1383.5 regions. Failure to hold FKLI traded price above support levels shall further indicates more selling pressure. 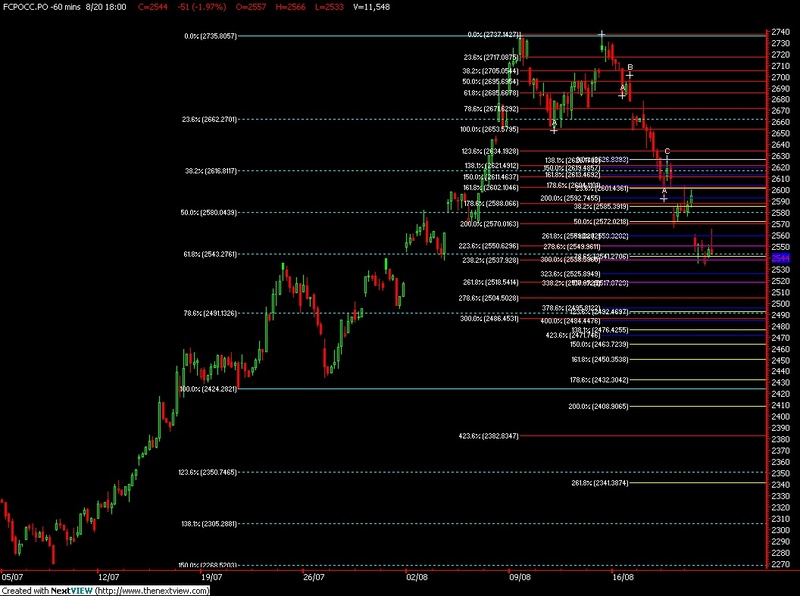 However, resistance levels seen at 1403 and 1417 regions. Crude oil traded little changed near a six-week low as forecasts that U.S. home sales probably plunged in July added to concerns the economic recovery in the biggest oil-consuming nation is faltering. Purchases of new and existing houses dropped 12 percent to a 5.01 million annual pace, the lowest since March 2009, according to the median forecast of 54 economists surveyed by Bloomberg News. Oil slipped 1.3 percent on Aug. 20, a day after the Labor Department said weekly claims for unemployment benefits climbed to the highest level since November. Crude oil for October delivery was at $73.87 a barrel, up 5 cents, in electronic trading on the New York Mercantile Exchange at 9:27 a.m. Sydney time. The September contract fell 97 cents to $73.46 on Aug. 20, when it expired. Futures dropped 2.6 percent last week. The dollar traded at $1.2691 a euro at 9:28 a.m. Sydney time, from $1.2712 on Aug. 20. A stronger U.S. currency limits the need of investors for commodities to hedge against inflation. Brent crude for October settlement traded at $74.41 a barrel, up 15 cents, on the London-based ICE Futures Europe Exchange at 8:38 a.m. Sydney time. The contract dropped $1.04, or 1.4 percent, to $74.26 on Aug. 20. FCPO 3rd month Nov futures contract traded RM51 lower to close at RM2544 levels as compare to previous trading sessions with a total of 11,548 lots traded in the market. FCPO price opened lower for trading as soybean oil and crude oil were settle lower during overnight trading but FCPO price soon consolidate within price range during trading sessions. FCPO price was trading above support levels at RM2543; 61.8% Fibonacci support levels, in the hourly price chart before attempt to penetrate day high at RM2461 regions. Technically, FCPO price seems temporary supported around at RM2543 regions but yet any sign of reversal appear in the hourly price chart after 5 – day consecutive south trading. 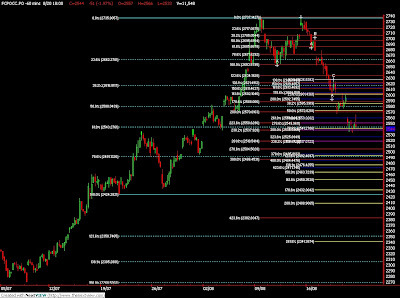 Next nearest support levels would be seen at RM2517 and RM2491 while resistance levels seen at RM2560 and RM2604 regions. FKLI Aug Futures contract traded 1.0 points higher to close at 1390.0 levels as compare to previous trading session to with a total of 4,480 lots traded in the market. FKLI price opened lower for trading as Dow Jones overnight settlement was traded lower while regional indices traded lower in the earlier trading sessions but FKLI soon manage to recover towards north to recover from losing ground. 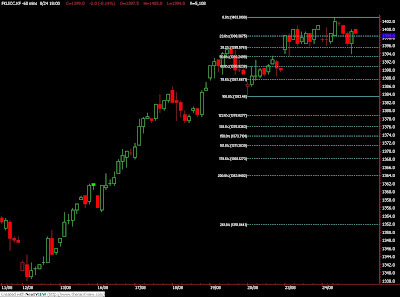 FKLI price manage to rest on support levels at 1384; 61.8% Fibonacci support levels, in the hourly chart before manage to rebound to test resistance levels at 1393, 78.6% Fibonacci resistance level. Technically, FKLI was expected to trade higher in the coming trading sessions provided support levels at 1384 and 1378 were not violated in the coming trading sessions. 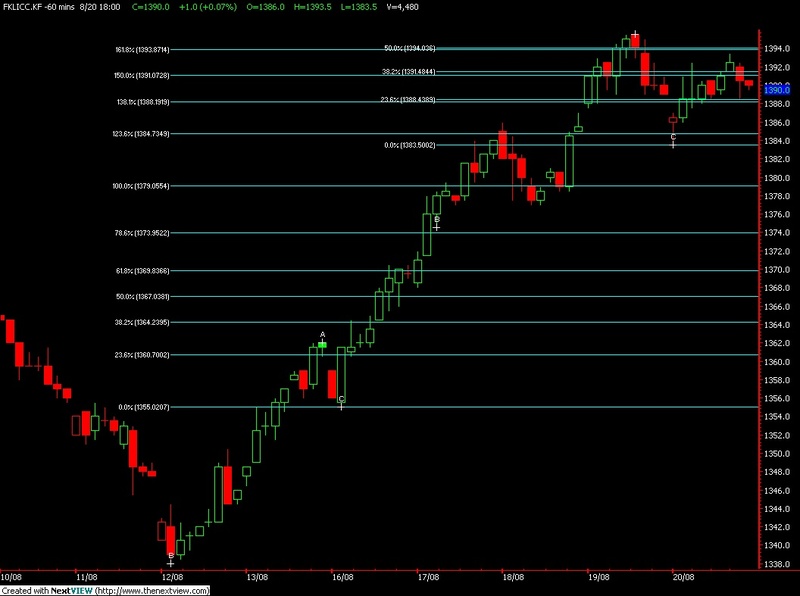 However, FKLI must overcome resistance levels at 1397 and 1412 in order for the rally to continue trading higher.